For this challenge, you’ll still get craft related things done, but not projects. For this challenge you need to spend some time on organizing, editing photos, cleaning, tagging digital kits, putting pages in albums, etc. Things that are needed, but not necessarily the fun part. Come tell us what you’ve done. This challenge runs all month. For the Monthly Team Challenge points you get 1 point for each one hour of work time. The time does not have to be consecutive, just keep track until your total is 60 minutes. Boy, do I have a lot to do in my room this month, if I get that far. Through the last couple of months, DD has crafted, and I've cleaned other areas. Why does other area cleaning always end up on my craft desk to deal with later?! This is where I'm going to get most of my points! We've moved to a new town the week before Christmas and my unpacking my craft room has not been a priority until now. Lots of organizing to do so that I can find my stuff to scrap again! angiew, we're pending a move soon. Going house hunting again later this week. If you have any tips for moving/unpacking, I'm all ears??? LisaDV, I could earn one million points for this challenge, because I have so much organising to do (tagging photos and kits, scanning old photos/negatives, finding old negatives to replace the photos I cropped into ridiculous shapes in my early CM days.... ). I'd never actually get any scrapping done if I did everything I need to do! LisaDV My biggest tip would be to purge as much as you can now. Go through closets and basements and really decide what is worth moving. I had about three months notice before we moved and I thought I got rid of a lot of stuff but I already have boxes to donate here at the new house. I will admit that I didn't purge any of my scrapping supplies because I knew I'd have my own space in the new place and so figured I would go through supplies at the new house. Another big thing is to label, label, label any packed boxes. We were lucky enough to have a moving company come pack us but all they labeled was the room it was in. It's been frustrating to have to dig through all the boxes to find that one thing we were looking for. Hopefully by the end of next week, all the boxes will be gone. I'd never actually get any scrapping done if I did everything I need to do! angiew, thanks for the tips. I've had several moving companies pack my stuff. Since we're keeping this home too, I'll have to pick and choose what's going and what's not, so I'm thinking that I'll pack it. Then I can also go through everything and get rid of what we don't need at all. I'm looking forward to that. nylene, I can see Sammie not only wanting to do that, but doing it so well. She's such an organizer! I love it! I have so much to do and this challenge is perfect for me to get a little more organized. What a mess. But I have kits made up now, including sketches, for a whole bunch of pages! msliz, I’ve totally been there. Organizing and cleaning for months and still not making enough progress. I’m glad you have some kits made. Sometimes You need to just deal with the mess and create. I have 3 hours (3 pts) for organizing and sorting and cleaning in my scrapbook yesterday. Back at it again tonight. This morning my DH brought in the box he made for my dies. It is 30 in. long and fits nicely across the end of my table. I have spent time cutting Home Depot magnetic heat vent covers and the cardboard that comes in the package. 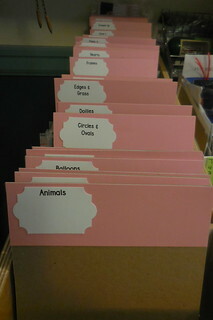 I cut up 12x12 papers (old AC pack) and used my newest Stampin Up punch to label all the dividers. The great thing about this box is that it has 5 removable dividers in case it gets too full. After 4 days of lots of work, I figured I spent 12 hours and the project is complete. Thanks, LisaDV , for this challenge. I have needed to do this for ages. I had to look through the whole stack to find what I needed. nylene, looks great! I need to do this. Can you share your categories? Can you share your categories? These are not in alphabetical order, but are in the order I typed them and I just copied and pasted. I'm sure there are others I will think of later. Arrows, Doilies, Edges & Grass, Labels, Stampin Up, Butterflies, Hearts, Tags, Circles & Labels, Banners, Flowers & Leaves, Frames, Words, Holidays, Background Covers, Rectangles, Animals, Balloons, Interactive, Christmas, Odds & Ends, Quickutz, Stars, Snow & Snowflakes, Tags, Squares. Thanks for sharing the categories, nylene. I appreciate it! That is amazing nylene !!! I have over 6 hours so far today organizing and organizing. I have so much done but so far to go. I like what I have done. Making my scrapbook room so much more functional and nothing that is not supposed to be in there is slowly getting put where it goes. I haven't claimed it yet, but over the last few days I have sorted through and stored away my Christmas crafting supplies. You would think that after several hours that my scraproom would be all neat and tidy, but although I have one counter cleared, the other is still stacked with stuff I am not quite done with. And this is why I never have a clean scraproom! I never have a clean scraproom because once it is all cleared and looking nice, I have an overwhelming need to scrap, scrap, scrap. This morning it was such a mess that I spent a couple of hours cleaning (not organizing) just putting things away. I am resisting the impulse to mess it up again until tomorrow morning. Good idea to use your baking papers for your boys, grammadee. Your organizing sounds great justlisa7. Remember Just cleaning gets you points in this challenge. I bought a new MacBook Pro and also a second EHD, so I spent a LOT of time over several nights backing up 17 years worth of digital photos and all my digital scrapbook kits. I have also scanned a lot of old photos. It took a lot of time away from scrapping, but I have been so worried about my EHD crashing and losing thousands of dollars worth of digital kits that it just had to be done. I wasn't that worried about the photos, because I have them all on CD or DVD as well. I've done 8 hours all up over the course of the month. Good reminder for us all to back up! So important.